Ready, Roll, Bingo! Let the good times roll with this fast-moving variation on Bingo. Be the first to cover up the last numbers on five Blackout cards to win. Dice determine the numbers to cover up, marked one to five, but special dice rolls include WILD, REMOVE and RE-ROLL, allowing more game play variations. 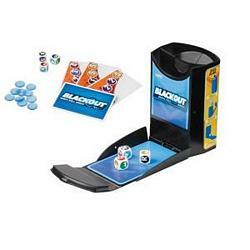 Be the first to call “BLACKOUT!” when these three special dice come up and take an extra card, moving you closer to winning the game. So get ready to roll and prepare for an extended Blackout!